Sanborn County Commission Chairman Jeff Ebersdorfer is pictured above accepting a plaque from SDML Workers’ Compensation Fund Administrator, Brad Wilson. 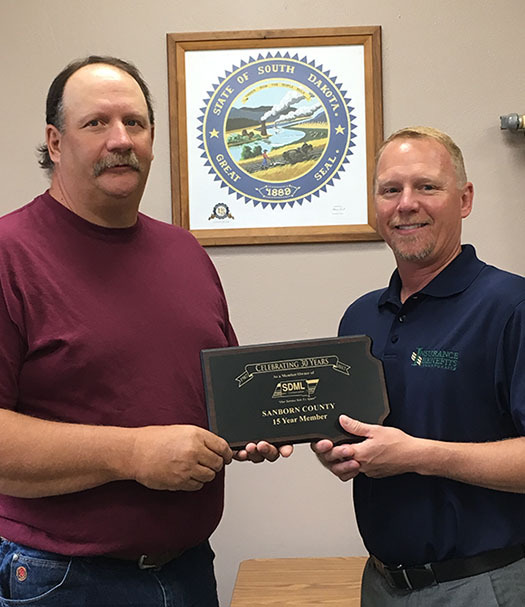 Woonsocket — Sanborn County has been honored for 15 years of membership with the South Dakota Municipal League Workers’ Compensation Fund. The Fund is celebrating its 30 Year Anniversary by recognizing long-term loyal members.